The famous english poet Byron once wrote “The most beautiful contact between the earth and sea took place at the Montenegrin littoral”. With this he described the Boka Kotorska bay. Belonging to the world most beautiful bay’s because the from the sea rising mountains, wrinkles azureblue seawater and centuries old seaside towns. Making it to a ideal sailing destination. But the montenegrin coast has more to offer then only this bay. With it’s 293 km long coast it is indeed a lot smaller then his neighbouring croatian but it can claim that it does has the similair qualities as it. More then a hundred beaches, islets, stunning sights with innumerable picturesque fishermen villages with always a sight of the mountainous landscape. Take with it the warm mediterranean sun that makes long day’s in summertime, refreshing seabreezes and the always dramatic sunsets. All with all an astounding area for sailing. For sailing the the weather and wind are a very important factor for a successful trip. The weather in the Adriatic sea is influenced by the general weather situation. Normally there is often a decent wind, with sometimes a storm mostly until July. In July and Augustus the wind is more quiet. From september the wind is getting stronger again. A high and stabile air pressure brings often wind that blows in the night from the mainland and from the sea by day. De Bura (bora) (northeast), jugo-siroco (yugo-scirocco) (southeast) and the maestral (northwest) are the most common wind types of the Adriatic coast. Especially in the period from September to May this winds will be most active. In the other summer months the maestral wind is most common. The bora is cold, dry landwind, strong northeast landwind, that blows from eastside of the Adriatic coast to the open sea and brings often nice and clear weather. This wind type is very hard to predict. In the summer days the bora last for only a couple of days, but in wintertime it can consist for one or two weeks. Burin is a northeast wind in the northen part of the adriatic sea and a southeast wind in the southern part of the adriatic sea. It’s a wind that mostly blows at night. Just for sunset this wind is at his strongest, after this it will quickly disappear. De Jugo (scirocco) is a warm, east-southeast wind. It comes, especially in the period of from Oktober till the end of Januar with dark clouds and lots of rain. Its not a abrupting wind like the Bora, but it has to have 36 a 38 hours to develop. It blows in the whole of the Adriatic. The jugo will normally blow for a couple of days in summertime, but in wintertime it can stay for 3 weeks. Sometimes this wind will bring redbrown desert sand from Africa with it. In this summer this windtype can develop from a local wind and will blow more present in the southern part of the Adriatic. Between March and June this wind will blow also in the north. A fast change in a couple of minutes from a Jugo windtype to a stormy and hard bora wind happens once in a while too. The maestral is a locale wind, that blows from the northwest, mostly in the summer. It will start around 10 or 11 in the morning and will achieve strongest power around 2 a 3 in the afternoon, after which it declines and becomes calm. This windtype usually brings nice weather en white clouds. This wind usually comes in high pressure area’s. The following seatowns or places are all seaside and have a harbour where people can moor or can sail by and be seen from the sea. Perast can be found in the Boka Kotorska. Once this area was the living place of the wealthier sea men and it was a real sea men town. During the time of the Venetian authority the town had the most prosperity from which it got it nice venetian architectuur. Close to Perast lays the isle of Gospa od Skprjela. Nowadays Perast is really quiet and it doesn’t count more then 500 inhabitants. 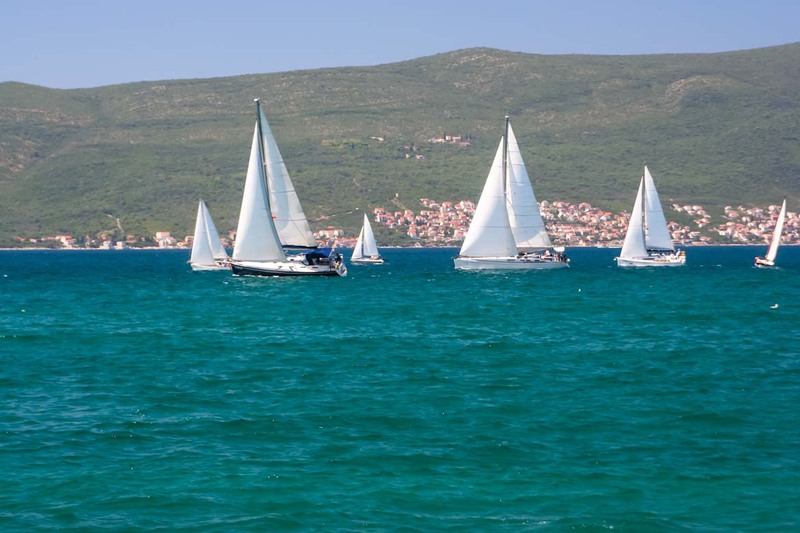 Herceg Novi is the first town who one will encounter when sailing into the bay. Although it is one of the youngest settlements of the adriatic coast, the town had a turbulent history, on which the many occupiers putted their sign. Making it to one of the most sight worthing towns of the montenegrin coast. De harbour is from Herceg Novi is from good nature and is in the summer busy but in the winter months pretty quit. The deepest lain in the extreme corner of the Boka Kotorska, Kotor is surrounded by high cliffs. The city was allready settled in the romain era and has an immense history. The old town is the biggest example of this and the town is putted on the Unesco list for world heritage. In wintertime the harbour is quiet and in summertime it is not that busy too. Tivat is the youngest settlement in the bay and were founded on the plateau under the Vrmac hill. In former days the more rich people of the bay had here there second accomodation because of the more open position to the sea. Because the fresh seabreeze in Tivat it’s more cooler then in other places of the bay. In this moment in Tivat there is been work on the immense project of Porto Montenegro. Porto Montenegro has to become a luxurious harbour that has to going to compete with the more well known harbours of the adriatic sea. Budva is the most important touristical settlement in Montenegro. This is especially of the many beaches that can be found in and around the city. Farther it has and city town and many possibilities to go out. In summertime many young people come here to have a good time, but the town has more to offer with its nice architecture and good restaurants. The harbour is very busy in summer but a lot more quiet in the winter. Ulcinj is the most southern town of Montenegro. In history Ulcinj was know as the pirate capital of the adriatic sea. Because of the long turkish occupation and position the town has islamic influences. What can be seen in the town environment and architecture. The harbour of Ulcinj is very small and is busy in summertime, but once again quiet in wintertime. Petrovac better known as Petrovac na Moru is a small town between Budva and Bar. It is a more quiet bathing resort then Budva and the beach lies on the opdirectly on town. For the coast are the two islets Katic and Nedjela. On Nedjela there is a small chapel and on Katic a couple of pain trees. The harbour is both quiet in winter and summertime. Bar is the most important port city of Montenegro on the adriatic coast. The city lies on the opposite of the italian town Bari. The old town of Bar lies country-inward and has no inhabitants. The port of Bar is responsible for all the economic ship transport and regular transport of Montenegro. Most of the beaches of Montenegro can be reached by land. But through the mountainous character of some of the parts of the coast some beaches only can be reached by boat. Making them very relaxing and even possible your own private beach on which one can sunbath and enjoy the sea. This former fishermen village lies approximately 5 kilometer from the city Budva. It is built on a peninsula and has kept his centuries old charm and beauty. In 1953 it transformed in a luxurious hotel and could it receive world know guests. In 2007 it got taken over by the Amanresort group. Unfortunately Sveti Stefan can only be visited of the coast. The Gospa od Skprjela is an artificial island just before the shore off Perast in the middle of the Boka Kotorska. The island is made by fishermen to worship the Holy Mother of God. On the island there is build a church that is through his architecture inside and outside a real sight. It is possible to dock on the island and to visit it. This two rocky islands lies before the town Petrovac. On Nedjelja there is built a church. At the entrance of the Boka Kotorska there can be found the Mamula island. This fort is made by the austrians and was used as a prison and defensive bunker.